I had a little time yesterday evening, so I decided to catch some live music. 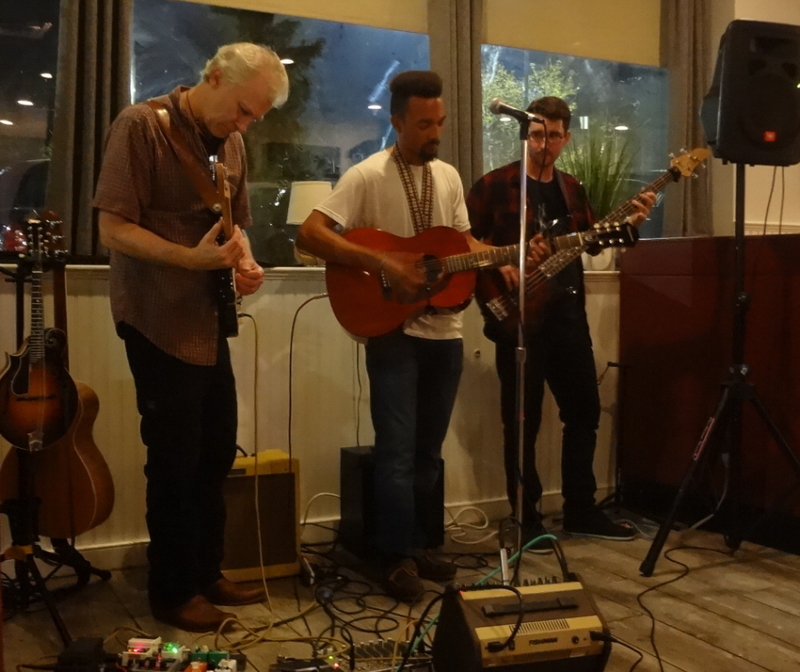 I almost opted for a redux of the Mychael David Trio at Hudson House Restaurant – I reviewed them at that very venue back in May – but first decided to check local listings to see if there was someone new I wanted to see. And, indeed, a quick search and a listen to a couple of Dwayne Haggins’ SoundCloud clips convinced me to check him out, allowing me to also try a new venue I had wanted to visit. And yes, I enjoyed my light dinner at Chill while waiting for the show to start. I had a pre-determined exit time for the show, which began a bit after its listed start time, so I only caught the first seven songs of the evening, but it was enough to get a glimpse of Dwayne’s talent. Dwayne sang and strummed his acoustic guitar. He was joined onstage initially by Mickey Roache on mandolin. After three songs, bassist Will Woyda made it a trio, while Mickey split time between mandolin and electric guitar in the three-man format. Residing largely on the folky side of country, Dwayne’s vocals are deep, rich, and smooth, with a bit of a lilt on some songs, not exactly folk but also adding a more folk than country flavor to his country songs. And when the electric guitar joins the fray, Dwayne responds by adding a bluesy element to his vocals. So it’s clear he has an extensive vocal range, though at least in a more relaxed setting like Chill, he ranged from country-folk to blues. The song selection leaned heavily country, while the interpretation would appeal to a broader, more general audience. 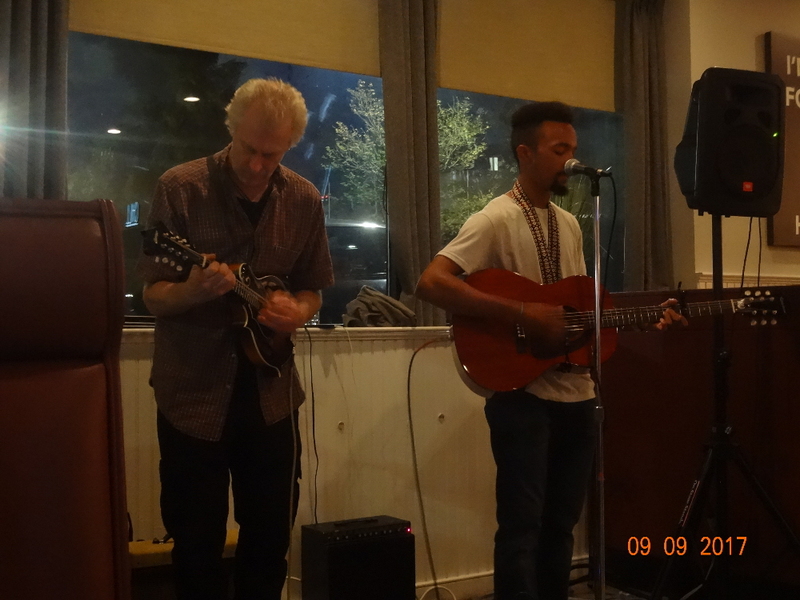 Dwayne kicked the night off with smooth, rich vocals, his warm, moderately deep voice joined by great mandolin accompaniment on a song I jotted down as “It’s All a Dream” (or something like that). The second song, “Wayfaring Stranger,” was very folky but a little darker and more brooding, exploring different elements of Dwayne’s voice. He followed it with a more rousing rendition of “Your Cheatin’ Heart” on which he unleashed a nice twang and howl. With Will Woyda turning the duo into a trio, Dwayne kept the tempo rousing and kept the mood Hank, delivering a smooth, rounded vocal version of “Hey, Good Lookin’.” Aided by lively mandolin, this performance was suitable for a roadhouse or a busy dancehall. Next up was “Rose in Paradise,” on which Dwayne utilized high, folky vocals with a subtle lilt. From there, it took me a while to realize I was listening to a rendition of Michael Jackson’s “Bad,” almost a blues-jam-type version of this song, such a good dye job that its pop roots were baely recognizable. This was the song on which Mickey switched from mandolin to guitar, and he employed a really crunchy, bluesy guitar sound. 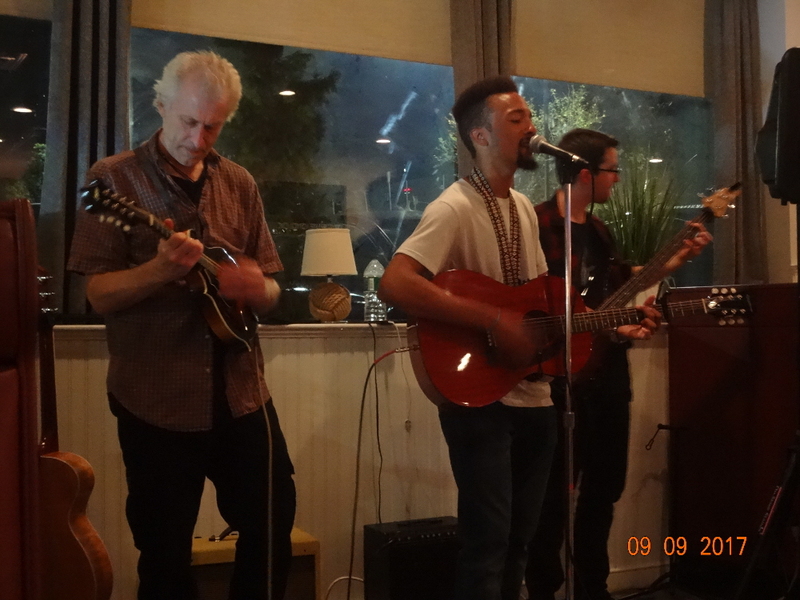 And the last number I was able to stay for was a howling bluesy presentation of “11 Months and 29 Days.” Dwayne showcased nice little subtleties in his voice on this song and throughout the evening – on this song, he was soft, deep, and bluesy, able to hit high notes for emphasis. Indeed, as much as I enjoyed the first few songs, I think the last two I heard were my favorites of the evening as Dwayne and his cohorts had started amping up the intensity a bit. I wish I had been able to stay longer. As the first set unfolded, Dwayne revealed different features of his impressive voice, slowly rolling out the breadth and depth of his stylistic reach, adjusting not just for song styles but also for the changing line-up of instruments involved. For sure, I’ll get out to hear Dwayne again; the longer I listened, the more intrigued I became by his skills. It’s clear Dwayne has surrounded himself with some exceptional musicians, as entire portions of several songs had been skillfully carried by a duo or trio partner; the evening was more like a band concert with an exceptional vocalist than a solo gig. Chill Kitchen and Bar has live music every Friday and Saturday night, with details on its website’s performance calendar. Pick and choose a night of interest, but if you can make it, I would suggest coming out tonight, Saturday, September 9th. One of the Blog‘s personal favorites, hot, rising local talent Sophia Ward is performing at Chill tonight. In fact, you already know how highly we think of Sophia if you’ve read our review of her performance at Twin Seafood just two weeks ago. Dwayne’s upcoming performances are listed on the “shows” page of his website. He’ll be at Nobscot Cafe in Framingham on Friday, September 15th; at Dolphin Seafood in Natick on Saturday, September 30th; and back at Chill Kitchen and Bar in Marlborough on Saturday, October 28th. Check Dwayne’s website for additional details and new dates as they’re added. This entry was posted in Live Reviews and tagged Dwayne Haggins, Geoff Wilbur, Geoff's Night Out, Live Review. Bookmark the permalink. I love Dwayne. He is a very talented young man. I may be a little biased since I did give birth to him. He surprised us all with his voice. I a.m. so proud of him.